Zombies must have gotten into the store and eaten someone's brains - because suddenly we have a ree-dic-u-lus number of items on sale! Help! You have to go hunting for them! Over 1100 items - now 50% off - scattered all over the site! What's a bargain hunter to do? I don't know what said "manager" was doing - maybe they were smokin' something - but it wasn't this new Hemp cord. We rolled this out for the Creativ Festival, and now we have it online - so you can get more! You get over 40 feet of each of four colours - so you can knot, weave, tie, kumi and braid to your heart's content! Rats! It must be Halloween - Zombies and Rats! We've had the Satin Rattail, in multiple sizes, for some time - but we've re-packaged it so that now it comes on those awesome re-usable Kumihimo bobbins. Stays cleaner and neater and you have the bobbin afterwards too! How great is that? We have the 1.5 mm Mousetail, the traditional 2 mm Rattail, and the larger, luxurious 3 mm Fat Rattail. Tassels are hot - and you can make your own! Wind, tie and snip and you will be tasseling the world. But in case you want your tassels ready-to-go - we have Faux Suede Tassels - in a variety of colours? Earrings? 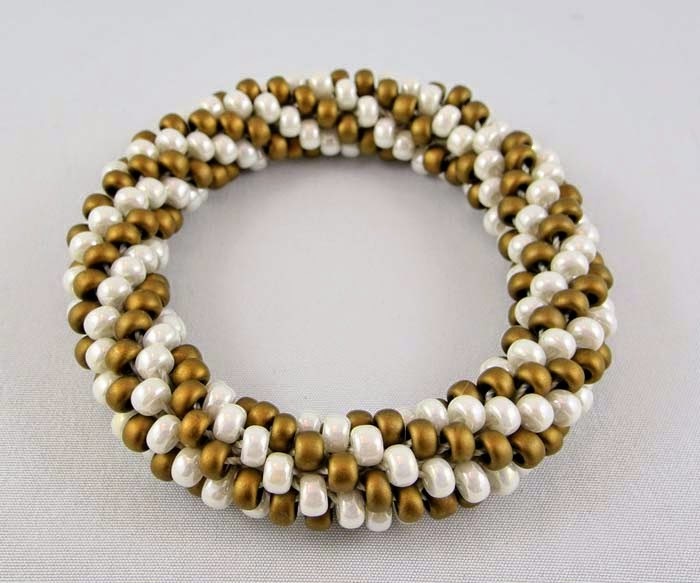 Fun, flippy bracelets? Home decor - curtains and lamps? And, if learning to Solder Jewelry was on your list of things to do this year - then you might be interested in this - a magazine format guide to soldering - technique guide and skill-building projects. Take the plunge! Check out all the new items here, or click on a link or image and hop directly to that item! Go forth and Bead Happy! You're never too old to start playing with dolls! You're also, never too old to start doing something you're not comfortable with. I did play with dolls as a child, but never really dragged them around, the way the other girls did. However, I remember the total joy of believing that Santa tucked a brand new doll (well actually three, as I have two sisters) under the tree at Christmas! As I grew older, I also confess to spending an awful lot of time, focusing on new fashion statements for Barbie! But did I bond with the dolls? No! They were just a pleasant way to exercise my creative spirit, and spend some quality time with my sisters. I don't actually remember any particular doll, other than the original Barbie (that I wish I'd kept in the original packaging). Is that sad? Somewhere in the early 2000's, I discovered Internet groups, and started joining any and all that caught my eye. Suddenly, I was flooded with emails, inspiration and colour! 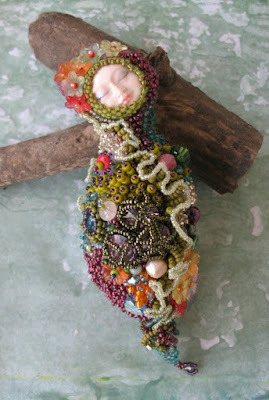 While I won't list all of my groups, I did entertain a particular fascination with Beaded Art Dolls. Luckily, the group was kind enough to let me lurk in the shadows, drooling over all the pretties. I loved the look of the dolls, but wasn't excited about the construction phase, and in the interest of full disclosure, I absolutely hated the stuffing part!! Okay, fast forward to a year or so ago, when I changed my mind! 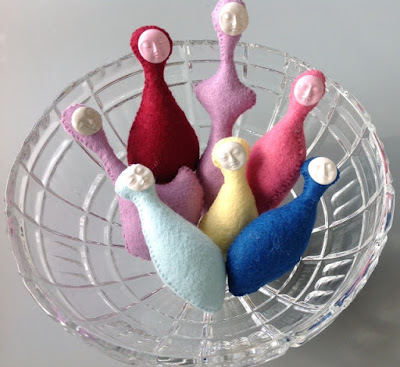 I had participated in a mini-doll swap, without tearing my hair out, so in the interest of Intuitive Bead Embroidery, and 3-D forms, I decided to make a slightly larger doll, and use it as a teaching sample. Not only that, but I had the brilliant idea to include faces (which I had never made before), and provide pre-stuffed forms, as part of the student kits. Sigh! Little did I know that it would be a very popular class, and I would be making a colourful smorgasbord of little dolls. Fast forward to today! I'm re-running my Nature's Muse: Beaded Art Doll class this Saturday, and like usual, I'm scrambling to stitch and stuff the forms. I quite enjoy the designing and stitching, but still hate the stuffing! However the results are worth it! These dolls are perfectly addicting, and though similar in naked form, take on unique personalities, once they start talking to you. Not one, turns out the same, and my students love them! So, don't be afraid to face your fears or objections. It's never too late to regain the wonder of childhood, try something new, or even revisit an old skill. You might be pleasantly surprised by the results! November classes - Getting you ready for gift-giving! 2015 is just flying by! November brings us Remembrance Day, Thanksgiving for our American friends and neighbours and lots of football! Our thoughts (although reluctantly) also turn to Christmas, Hanukkah and other gift-giving holidays. What about creating your own gifts by learning the techniques in one of our classes? A class makes a great gift too for your creative buddies and family members. November is chock full of new classes from our roster of inspirational instructors! Angela Peace brings us a new soutache bracelet and Christine Woollacott will teach you how to incorporate your own pencil drawings into enamelled charms. 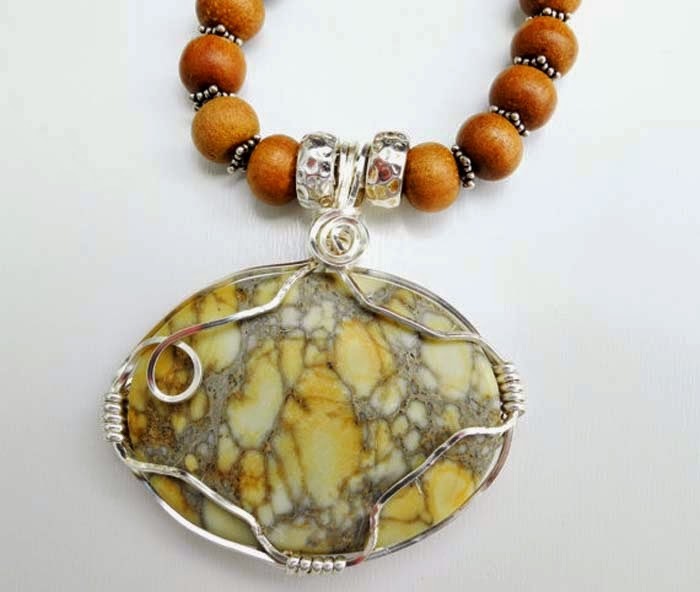 Pamela Kearns has a new peyote pendant project. 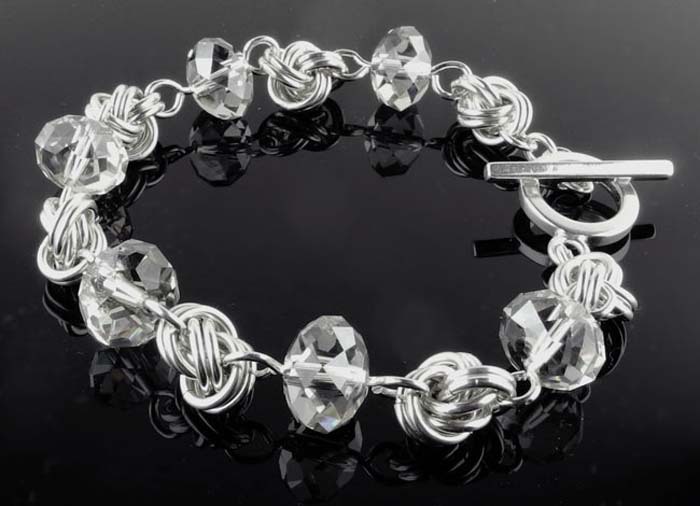 If you're into chainmaille, you'll love Marilyn Gardiner's two new classes! Wirework lovers will thoroughly enjoy Jen Rosen's and Deborah Beesley's new bracelet projects. All of this in just the first half of November. As well, we have lots of encore classes for your learning pleasure! 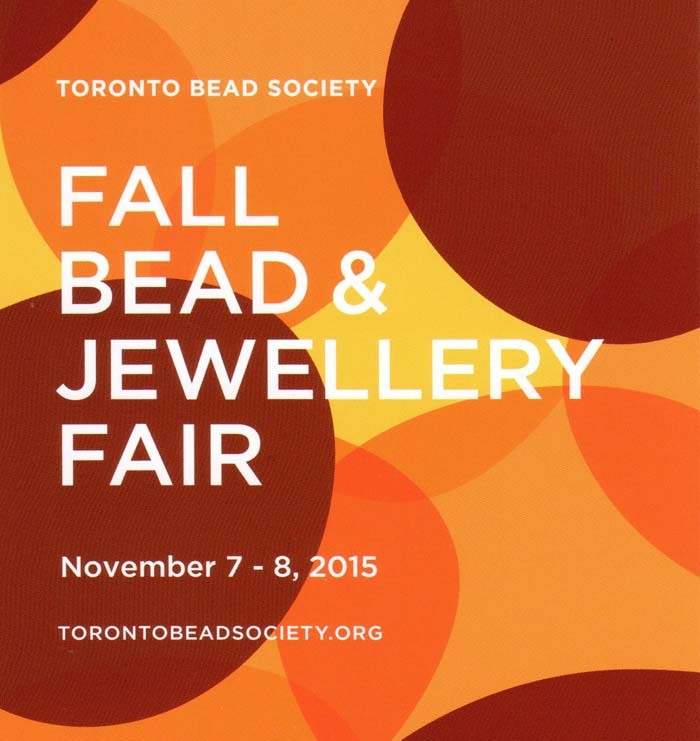 Join us at the Toronto Bead Society's Fall Bead and Jewellery Fair taking place downtown Toronto. 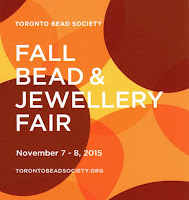 We'll be there with lots of beads, findings and much more! For complete information about course outlines, class fees and more, please consult our website. Click on Classes and follow the links to the November class calendar. Wow. I love chain mail. In 2003 my son started begging me to make him a chain mail gauntlet -- ROM summer camp influence I think. So I discovered The Ring Lord in Saskatchewan and ordered green aluminum jump rings and went online in search of instructions. 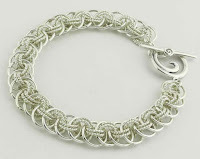 I found a wonderful online resource library of chain mail weaves at mailleartisans.org and started to play. I was an avid needle worker at the time, creating intricate samplers with silk on linen but I was fascinated, at the Creativ Shows, by chain mail as demoed by Marilyn Gardiner at her booth. 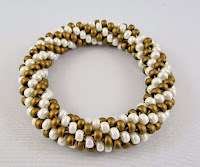 My interest in adding beads to my needlework drew me to the TBS Fair and the rest is history. The next thing I knew I had signed up for a Byzantine bracelet class wth Marilyn at Beadfx and I had moved on to sterling silver rings. In the picture above, you'll see a small pouch that I purchased at the flea market at Place d'Aligre in Paris. Here's a close up of it inside. 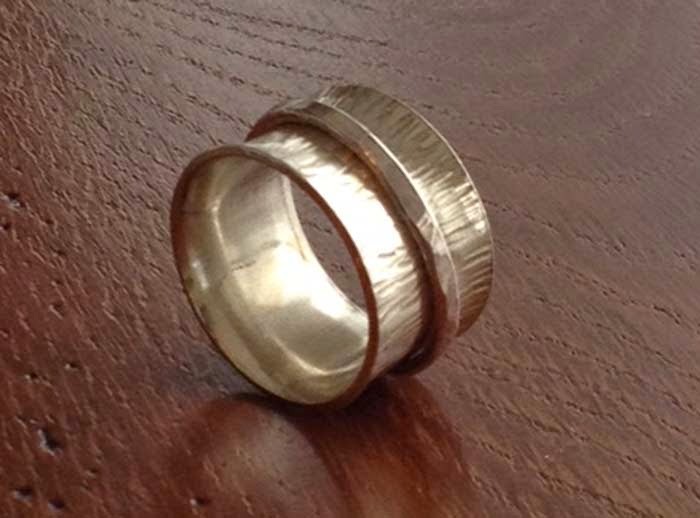 It's in perfect shape and sports a beautiful natural patina. There are two sections inside separated by a chain mail wall. I talked the vendor down to €40. At another flea market I saw a pouch like this for €60 and an envelope sized bag, in ragged shape, that the vendor would not sell to me for less than €150. Add a little more than half that price again to find the amount in Canadian dollars. 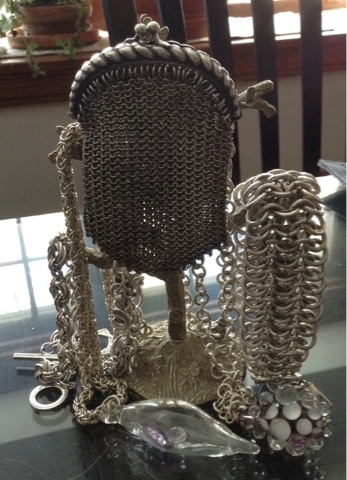 I'm thrilled to own this little beauty and plan to create a chain mail chain from which to hang it. 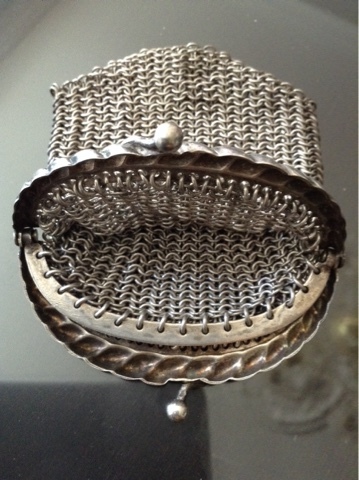 The same weave, in 12 gauge sterling silver rings, appears in one of the first bracelets I made. These big, heavy rings were so difficult to open and close and I'll likely never make another -- considering it cost over $80 to make in 2004 when silver was about $9 an ounce! I wear it all the time. I've never cleaned it in 12 years and so it has patinated naturally. 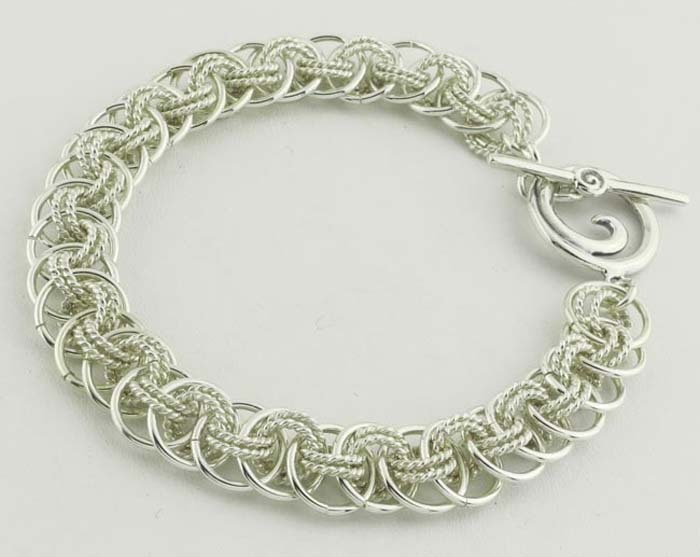 We are so lucky to have access to quality jump rings in Canada through Marilyn Gardiner Design and even luckier that she teaches here and shares her knowledge and enthusiasm for beautiful chain mail jewellery that will become instant heirlooms and stand the test of time. 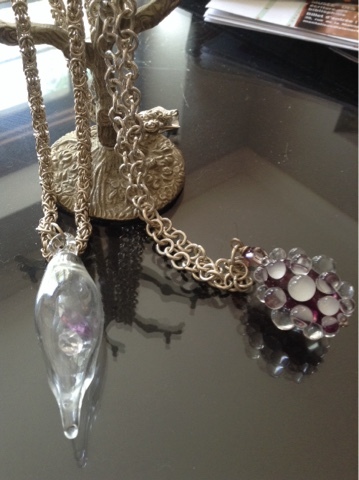 I urge you to try your hand at chain mail if you haven't yet -- you'll enjoy the freedom of creating custom chain for beautiful lamp work and glass beads such as the two in the photo below -- by Natalie Baird on the left and Muriel Duval on the right. Besides online resources, you'll find a lot of great books on chain mail. Marilyn Gardiner carries many of them, and Chains By Becky is a great starting point. It's pricey but worth it. And now, Marilyn's own book Modern Chain Mail Jewelry: Chic Projects to Complete Your Look is available. 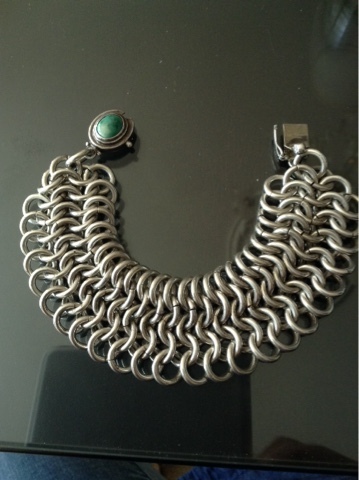 So many projects that combine unique beads and perfect chain mail. You can order it from Beadfx! So I'm off to make some chains for the projects I started while at the workshop in France. More on that next week! Your website and online shop are always a work in progress, one thing that keeps people coming back is having new work or information there every time they stop by and visit. Rather than updating everything all at once, my goal is to update my website in at least a small way every single week between now and Christmas. It’s easier on my workload and it keeps my website nice and fresh. A weekly web workout. I am attracted to the heavier jewelery. When the new chains came in, a pictured of them braided popped into my head. Not afraid to mix metal colours, I tried for an elegant and an everyday mix. Both appealed to me. The finished bracelets are approximately 7.5 inches long. Half-full of sparkling ideas! Woohoo! Choose your own colour combos and make your own fabulous crystal rhinestone bracelet! Cupchain in 3 colours and 2 sizes, and earrings too! The two sizes are for size SS 29 stones, or SS 39 stones - and we have both of those too! 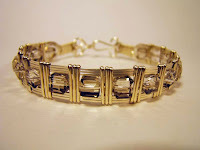 To assemble, just place the rhinestone in the cup, and fold over the prongs to hold it in place. Use a flat metal tool, like a butter-knife or the handle of your tweezers to press the prong down into position! Easy peasy! And then pick your stones! You'll need 18 of the SS 29s for the SS 29 bracelet, or just 16 of the SS 39s for the SS 39 bracelet. I had to restrain myself from making a whole bunch of these! Something else I had to exercise some restraint on this week ... Carved Stone Pendants! Serene Dancing Monks in Lapis, Dragon with World Pearl in Black Onyx (just to avoid confusion - there is no pearl - the image is of an Asian dragon holding up a round object, referred to as a pearl - which represents the world. It's a very traditional image.) And how about this Coiled Dragon in Serpentine, which we have only one of, because I didn't resist. Not feeling dragony? How about this wonderful leaping hare carved in Golden Obsidian? Is that not something else? 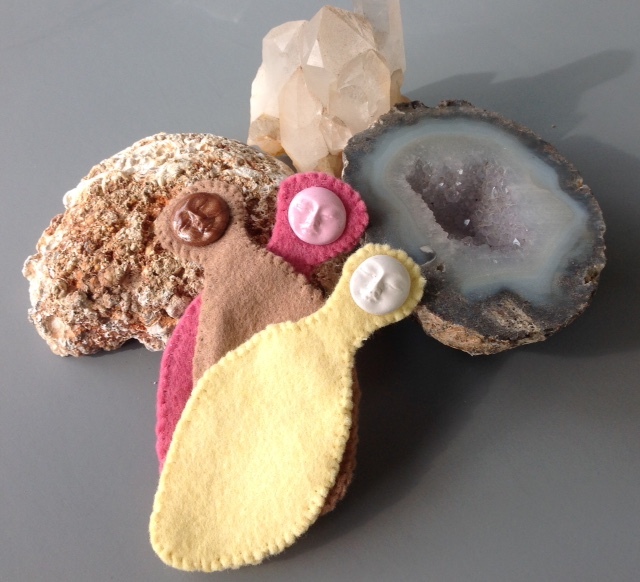 Or how about some Druzy (or Drusy) beads! Druzys, (Druzies? - beats me) are naturally occurring crystals, like quartz or agate, that form in isolated pockets in the ground. They can be plain, or "jazzed up" by fuming precious metals onto them to produce rainbows of exquisite colours. 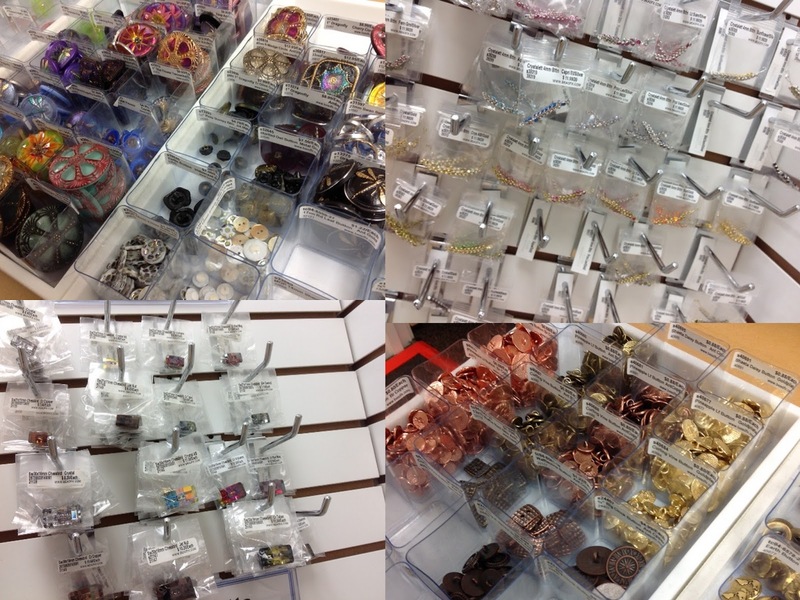 We have some cabochons, and some beads - with druzy windows. Such fun! I really like these Natural Druzy beads with silver plated sides! Lots of other cool new stone beads this week too - these - these amethyst rough chunks are particularly drool-worthy. And these copper plated Hematite Skulls are just the thing for a skelly-ton-inspired pair of earrings - just in time for the hollow-weenies! I could blather on about the cool new stones all day, but you can check out all the new items here, or click on a link or image and hop directly to that item! Go forth and Bead Happy! Do you remember playing in your mother's button box as a child? Reach back, far back, and reflect on the sound and feel of your fingers running throught the coolness of the buttons. Aren't memories wonderful? Who doesn't remember the sweet, sweet smell of apple pie baking, or waking up to the rythmic sound of the percolator (I know, this has nothing to do with either buttons or beads). According to "The Button Craft Book", by Dawn Cusik, the earliest buttons date back to 2000 B.C. I'm pretty sure that those buttons were probably made of bone, wood or rock, and destined for purely utilitarian purposes. I won't pretend to be a historian, but the art of crafting buttons, certainly grew from there. Buttons have been made in all shapes and sizes! They can be made of glass, metal, shell, ceramic, china, clay (including polymer), plastic, Bakelite, resin, paper mache, stone, wood, nut, and many other materials, that I've probably never heard of. I bet that you could even laminate layers of paper, and make a button out of them! Hmmmm, perhaps I should try! In the 1860's, a popular pastime for Victorian girls was to make Charm Strings out of buttons (and other decorative bits). The aim was to collect 999 buttons on the string, because when you did that, Prince Charming would come and sweep you away. Rules for collection were few, but buttons could not be purchased, as they needed to be gifts from family, friends, or suitors. 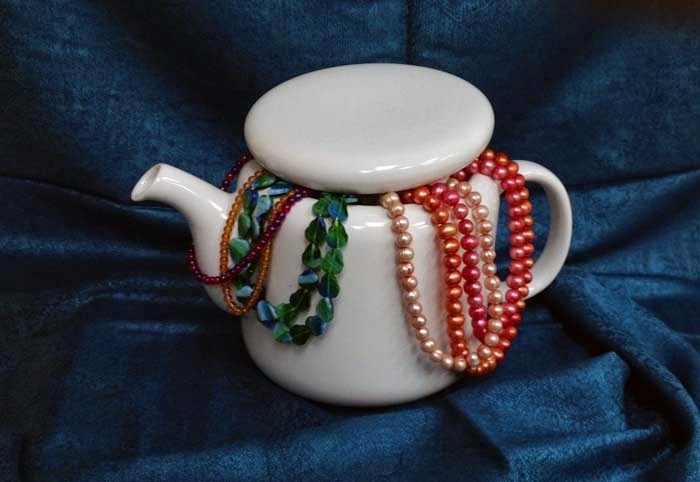 Prince Charming is long gone, and I may never make a charm string, but there are many other beading applications that could use a button or two! Vintage buttons are still available, but are increasingly harder to find. Luckily, BeadFX has a good supply of metal, Swarovski Crystal (including Crystalettes), and vintage Czech glass buttons (made from the original molds). Use them in bead embroidery, necklaces, bracelets, earrings, Kumihimo, quilts, bead crochet, and knitting! 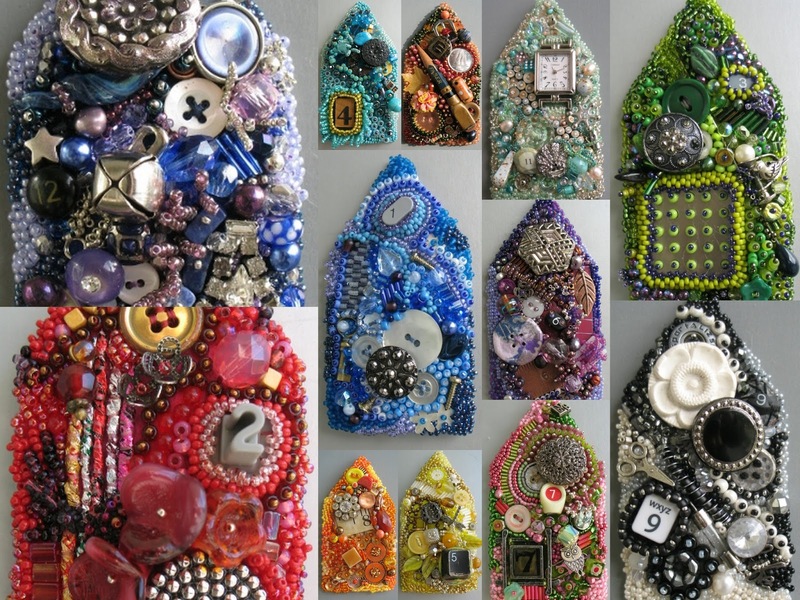 Glue them to a button converter, and make a brooch out of them! You could even frame your collection, or (shocking thought) use them to actually fasten or embellish clothing! 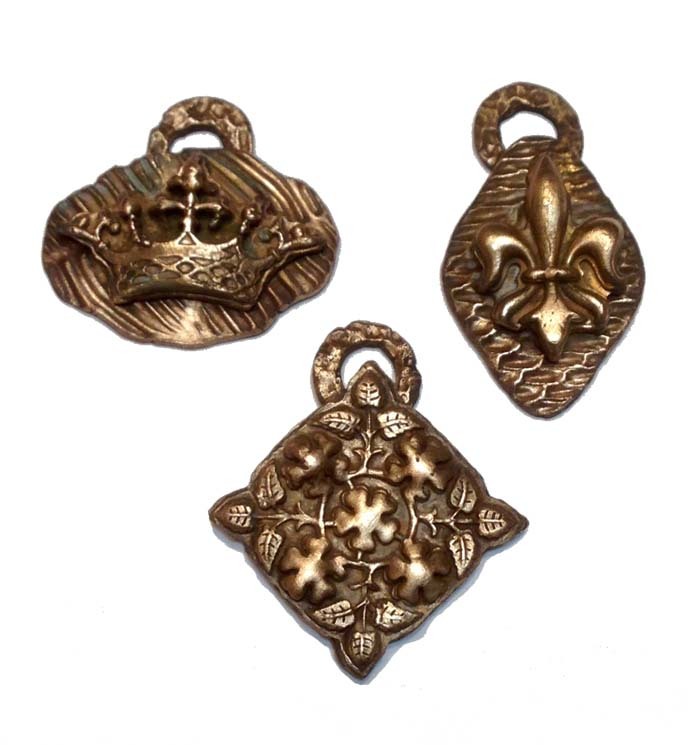 I've made molds (using two-part silicone, mold making putty) from vintage buttons, and then filled them with either paper clay, polymer clay, or resin, for totally unique cabochons. The choices are endless! On a personal note, I've used vintage, new and family buttons, in my bead embroidery, and have also used vintage shell buttons in one of my favourite mixed media necklaces. Perhaps I should challenge myself, to make a mixed media "Inspiration", that includes buttons! Would that be something that interests you? Have you ever made anything button inspired? If so, I'd love to see photos! Please, please, start your own button collection. Your children and grandshildren will certainly thank you for the memories!!! The Business Chat - Let's ship! Yay! Someone clicked the Add to Cart button on your website/online store and purchased your fabulous earrings!!! Congrats!!! Now, before you run off to celebrate you still have work to do. You have to get those earrings to their new owner. You have to ship your product. Of course it won’t be that much work because before you listed those earrings you thoroughly researched how to ship, what packaging to ship in and how much to charge for shipping. And of course you posted all of this online or in your booth (where you took an order for the earrings). The customer is well aware of how much the shipping is and how long it will take. All that you have to do is put the earrings in the package and mail them out. Since the busiest buying season is gearing up and the orders will soon be flocking into your inbox let’s talk about how to get those products out the door in an organized and lucrative manner. How much does it actually cost to ship a pair of earrings? Or a heavy necklace? Or (fingers crossed) 5 items? To calculate this, put together several sample packages and visit the post office or their website. Use a variety of addresses, I used BC, Nova Scotia, Florida, California, England and Australia. Go on, dream big and imagine your jewelry shipping all over the world. 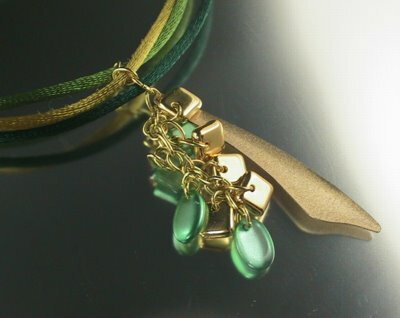 Put together a sample package of a small item such as a pair of earrings, another package of a heavy necklace and a package of several pieces. You don’t have to use the post office; there are also courier companies such as UPS, Fedex or DHL. While you’re researching investigate all options. While most companies (including Canada Post) have their rates listed on their websites, I found it easier to go to the office and have them weigh it and tell me the options. Sometimes they have information or suggestions that isn’t easily found online. For the most cost effective shipping you may need to reconsider your packaging. In Canada, using Canada Post, there are height and weight restrictions. If the envelope is higher than 2 cm it is considered a parcel (much more expensive). So a package containing earrings in a box is called a parcel, the same earrings in a gift bag can be mailed as a letter. As cute as my boxes are the extra $6 in shipping costs isn’t worth it for me, and all my items are mailed out in gift bags. Whatever you use to ship in, make sure it will protect the items. On a suggestion from my local post office, I never ship a package with my company name on it. I use my personal name and handwrite the address rather than use a label. Why? Because it is less likely to be stolen. And it works. Insurance is to protect you, the seller. Shipping is an aspect of customer service, and in the event there is a shipping problem, you may face an unhappy customer. Consider purchasing insurance on big-ticket items, or adding a small amount to each item cost so that in the rare cases where packages get lost, you have a fund that can cover you. You can find out the cost of insuring your package from your postal service. Some expedited services have certain insurance packages built in, so look into that before buying additional insurance. Keep in mind that insuring a package will cost, so if you are offering this as a free incentive you must remember to build the cost into the price of the jewelry. Another tip, courier companies will not insure jewelry when shipping internationally. They will however insure fashion accessories. If you are shipping to another country, you'll need to include the proper customs documentation. Do not mark it a "gift" if you're mailing an item you've sold to a customer. Check with your country's postal service to find out exactly what forms you'll need to attach to your package. Theoretically, filling out these forms thoroughly should prevent your package from getting held up in Customs. Shipping internationally will go smoothly most of the time. Every so often a package can get stuck in customs. Make sure your customers are aware that you can't be responsible for these delays. It's nearly impossible to track a package once it leaves your country. The buyer is responsible for any additional fees that may be charged at customs, make sure you add this to your Shop Policies page. Link is http://www.canadapost.ca/tools/pg/manual/PGabcmail-e.asp#1387539 - Canada Post ABC’s of mailing. When in Canada for U.S. and International Xpresspost and Expedited parcel services, fill out the 'Customs Declaration' section of the shipping label. For U.S. Small Packet/Light Packet, CN22 Customs Label (white for SP, green for LP). In the USA you'll need a green CN 22 customs form which you can pick up at the post office or order for free from usps.com. And the most important question, what should you charge for shipping? Or should you charge at all? Many new sellers automatically offer free shipping thinking that will be a great incentive to new customers. Free is always good, however free isn’t always good for your bottom line. If you sell a $15 pair of earrings that you ship in a box and your shipping cost is $8, offering free shipping means that you will lose money. Let’s use Judy as an example. Judy is just starting to sell online. She has made a pair of earrings and wants to list them. The earrings cost $4 to make (including the box she packages them in), her labour cost is $4. Judy doesn’t intend to sell wholesale or on consignment, so her retail price on the earrings is a minimum of $24. Note that this price doesn’t include shipping costs. If Judy want to include free shipping she must add the actual shipping cost to her cost of materials. When Judy visits the post office to research shipping, she finds that to ship her earrings in a box and bubble wrap envelope the cost is $8. The same earrings in a gift bag ship for $1.22 (plus the bubble wrap envelope). If she wants to ship for free, her earrings (in a box) must be listed $48. To ship for free in a gift bag, the earrings will be listed $30. Best for her to repackage in a gift bag, list the earrings at $24 and charge $2 for shipping. A huge mistake most new sellers make is to downplay what people are willing to pay and give away the farm. Not charging for shipping means that you are willing to lose part of your profit. Oh and also not charging for shipping packaging. I know that mailing envelopes are cheap but they aren’t free. It’s called Shipping and Handling, when you buy online from large companies not only are you paying for the envelope, you are paying the labour costs of putting your item into the envelope, filling out the address label and licking the stamp. While Free Shipping may seem like a great option it is generally not cost effective on lower priced items. And it is never cost effective if you haven’t built the cost of shipping (and shipping packaging) into your price. Don’t pay too much attention to what other people are doing, just because someone else is willing to lose money this holiday season doesn’t mean you have to follow. Do your research, crunch your numbers and come up with your company shipping policy. Once you know what this is, tell your customer. Inform them on the front page of your web site how much shipping costs. Tell them how long shipping takes. Tell them again in each item description and on the shipping policies page. I fell in love with the new Swarovski pearls, as soon as I spotted them on Lee’s neck! As a rabid collector of shiny objects, I felt that I was justified in buying them. Besides, I was working the Swarovski Launch, so needed something sparkly to wear. After all, I didn’t want to letdown my peeps! Now what did I do? I set about arranging and re-arranging the pieces, until I had an arrangement that pleased my eye. I wanted asymmetrical, so started by joining the three rivolis sets, and then just played with the rest. The components were joined together, with split rings, for movement and security. Split Ring pliers (S23234) really helped with the process! Of course,you could also choose to use jump rings…. 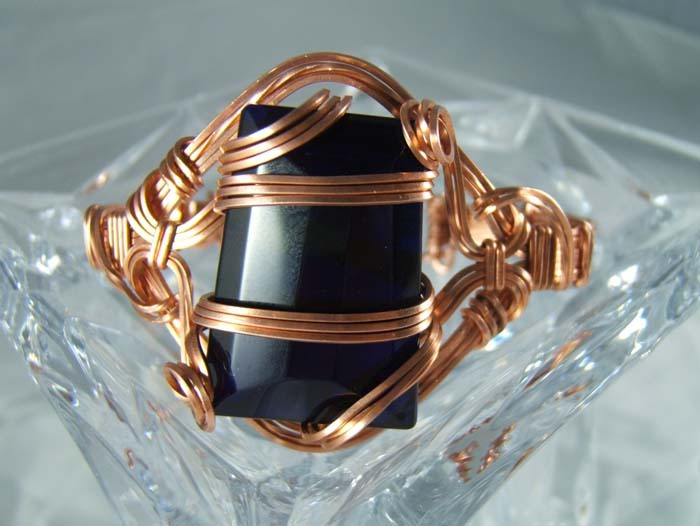 Many of you, already know how to make wrapped loops, but if not, check out our “Tips and Techniques” page, or toddle off to Pam’s, “Jewelery 101” class. You might also spot me, on Wednesday evenings, at the “Open Bead Night”, or even some Thursday’s at “Bead Tea” (if I’m not working). For the right incentive (bwaa haa haaaaa), I might even be persuaded to demonstrate! My Scarabaeus Flash Necklace ended up being a total of 20” long. Yours could be shorter! Make it to fit your body type, add a clasp if you want to, and just enjoy the process! I confess that I used up all of the Coin Pearls and Rivolis, but still have stash enhancing leftovers. As always, I have more ideas! Designing your way out of a paper bag! The Business Chat - Tell me your secret! Where did September go? and Bueno Notches.